Apart from being a legal necessity, annual reports are a great way to show people your company's growth over the year. The most common annual report design is a simple PDF, with a generic collection of numbers and data. Then there are some annual reports that really shine, complete with digital interactivity or a unique printed design. These often become quite famous, like Vimeo's annual report from 2013 and Mailchimp's report from 2016. Some companies even develop a second creative version of their annual report, just for online viewing purposes. These are typically called "A Year in Review" and talk more about milestones and events than financial data. To get you inspired, we've rounded up some of the best annual reports from recent years in various formats: online, interactive, print and video. Vodafone's 2018 Annual Report has just the right amount of interactivity to take away the boredom of a regular presentation. The hero images are large and very attractive, with animated text and transitions in between. Navigating from one section to another is achieved with a horizontal menu and the data is displayed with strong brand colors that stand out. This annual report is easy to look at and navigate, and is the complete opposite of boring. You could almost say it's the “perfect” annual report. You can also download the PDF version if you want to save a copy. Far more interesting than a bunch of static charts, Corby's 2018 Annual Report features direction-aware hover effects that are activated by your cursor movements. It’s fun, colorful and definitely memorable. 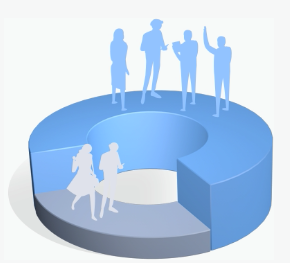 Each section of the report has a unique illustration for an added creative touch. When you click on a section, the transition is a three-toned wave animation. Also, the buttons bubble when you hover over them. The information in Corby's annual report is presented with impeccable storytelling. Instead of boring charts, they have used wonderful imagery. Data is also presented in bite-sized chunks, which makes it easier to look at and understand. For more in-depth data, viewers can easily navigate through the links and prompts within the stories. Pharma giant Roche published a highly visual experience for their 2018 annual report. All the hero "videos" flow seamlessly into the content. The first video even has a swipe effect with an X-ray image of a human skull. The navigation has buttons and scroll options, yet there is no way you can get lost in between the sections. The data is displayed using animated charts designed with the brand colors, making it hard to get bored. This annual report isn’t too creative in terms of design, but it incorporates video and animation really well. Old Chang Kee's annual report for 2018 is not interactive, but it's refreshingly unique in its own way. 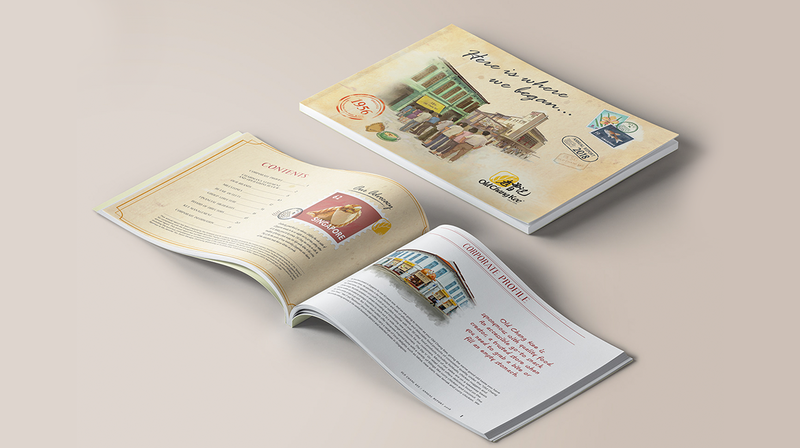 Although it's a printed report like many others, it comes with an added creative factor: a vintage-style paper texture background and hand-drawn illustrations that bring the early days of Old Chang Kee to life. The charts are created in a handmade style, which gives them a unique touch. The designers also added a little extra personality to the images by making them resemble postage stamps. This annual report stands out for its design creativity and we love that! The 2018 Habitat for Humanity annual report is the perfect example of parallax scrolling done right. Their photography is spotless and full of smiling people, which reflects their brand values. In addition, all the information is easy to read, with large titles and text. Sections are separated by a parallax background of a branded icon illustration. We love that this annual report is so visually rich and makes sure that it gets the intended message across clearly. Green Chameleon's Year in Review for 2018 is like taking a journey through time. As the months fly by, we see all the projects they have worked on. Each item is clickable and can be looked at in detail. They all open in a new window, so don't worry about your journey being interrupted. This annual report is defined as a Year in Review because it doesn’t show any financial information about the company. What it aims to do instead is visualize what the company worked on throughout the year. We think it's an innovative way of showing success and portraying their overall creative outlook towards interactive design. Looking to create a stand-out visual annual report? When it comes to interactive years in review, Oscar offers a great example. In 2018, the insurance company published an annual report that's guaranteed to make anyone reading smile. There are prompts to move the arrows in different directions on the screen and every movement continues the storytelling of Oscar’s Year in Review. As hands move on the screen showing different bits of information, the title at the top changes according to what's being shown. There is also a menu on the right which prompts the viewers to share the report on social media. This report is a lot of fun and definitely one to remember. We love that the colors are well chosen and the amount of text is just right. This year, Twitter shared their Year in Review in (you guessed it) a tweet! This time, though, it's a video tweet. True to Twitter fashion — short and sweet — the video is only 38 seconds long. Just like they've done in the past, Twitter visualizes the most retweeted tweet, the most commented tweet and other Twitter superlatives. The video is designed using Twitter's brand colors and features modern music in the background. This is one of the finest annual report examples out there that are actually "on brand." Some annual reports are short and some are simply gigantic, but the 2018 annual report by ABInBev is truly enormous. Even though it's full of information, it doesn't feel overwhelming. Simple animations make the transitions between sections seamless. 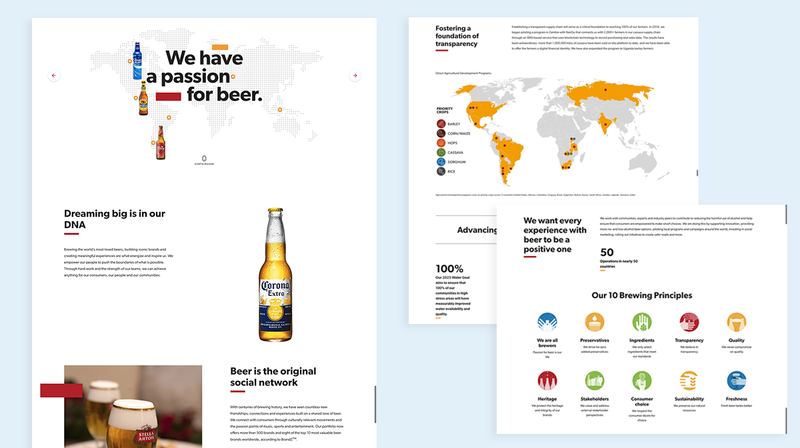 Our favorite part is the landing page, which has a hovering map showing the favorite beer in each part of the world. 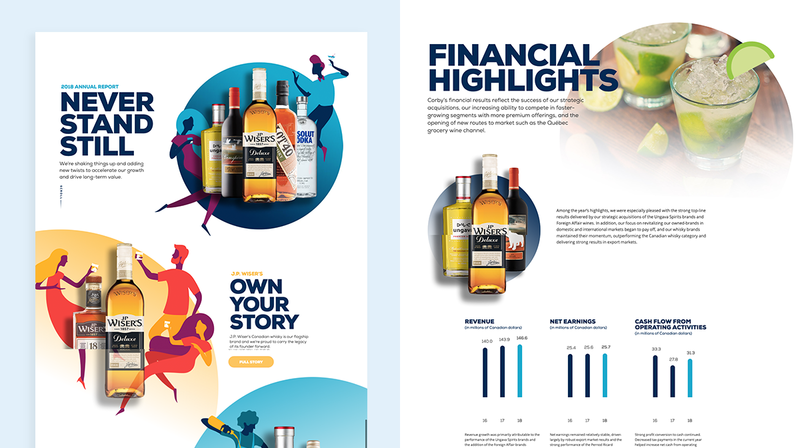 The designers at ABInBev used an asymmetric composition for the content and decorated the image sections with brand-colored rectangles. This keeps the pages interesting and in constant movement. This is one of the best annual report examples out there for presenting a lot of information in a non-boring fashion. The Swiss energy company, EWZ, offers an immersive and interactive experience with their annual report for 2017. The welcome mat is a floating, three-dimensional illustration of a piece of land, with prompts to explore the different areas. After clicking through, you can explore further by using the sideways scrolling navigation system. The best part of this highly visual annual report, apart from the beautiful illustrations, is the soundtrack playing in the background. Rather than just generic music, the soundtrack is actually an ambient sound that reflects what is happening in each area of the screen. 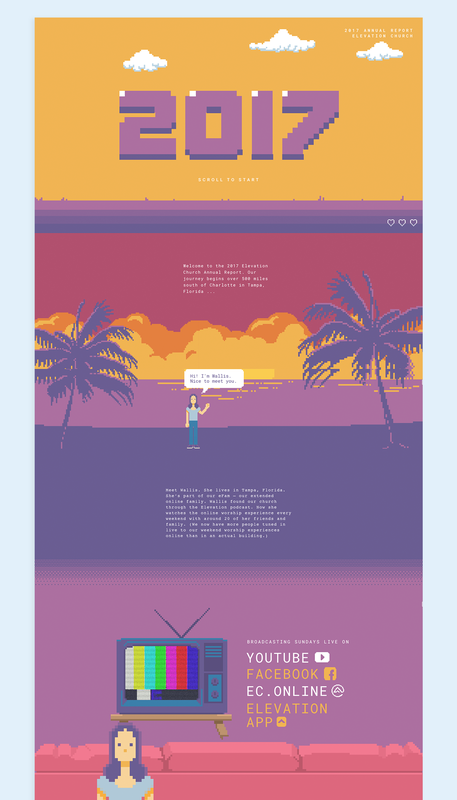 I personally love this annual report for its creativity and interactivity. The 2017 annual report for Elevation Church was designed to look like a pixel video game. The navigation is a vertical standard scrolling system with some simple animations that work perfectly with each other. The colors are mute, yet agreeable, which makes it easy to scroll through the site. The design truly makes the viewer want to see more. This annual report uses a tiny character to tell the story of how Elevation Church grew over the year. The data is presented with big numbers and simple charts, which makes it easier to read and understand. Fun annual reports like this one are worth keeping as an example of how things can be done differently with great results. The 2017 annual report from Weatherford is far from a standard report, mainly because of its innovative, four-part vertical navigation and dynamic titles that are designed with large letters crossing over onto an image. To enter each new section, the windows open vertically like tabs. Better yet, the reader never loses sight of the main menu and the most important sections since they remain on the left side of the screen. We really like how the interactivity is minimal in this report, but just enough to make it different and innovative. 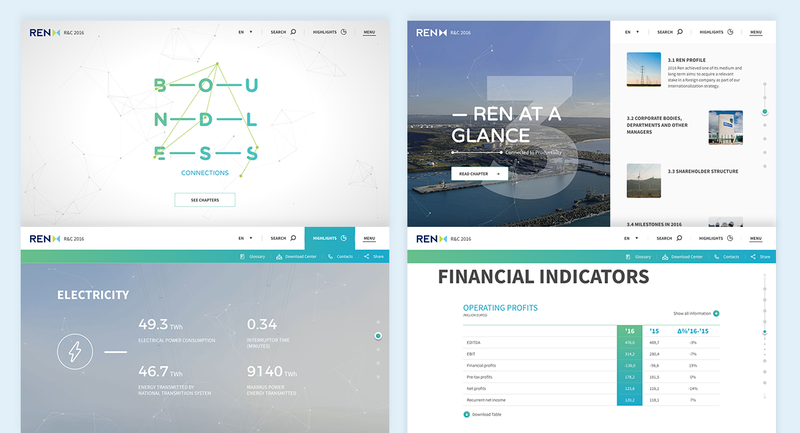 The Portuguese energy company, REN, published a wonderful interactive annual report in 2016. They've used animated polygonal scatter dots, which were pretty big back then. In fact, they still look good in this report. The title of the report is “Boundless Connections” and the letters are actually part of the navigation design. The interactivity of the report is mostly in the title and highlights. Once you enter each chapter, the content becomes more standard. The designers created a good balance between the two, giving the report just enough interactivity to make it stand out while not forgetting the investors who just need to see the numbers. 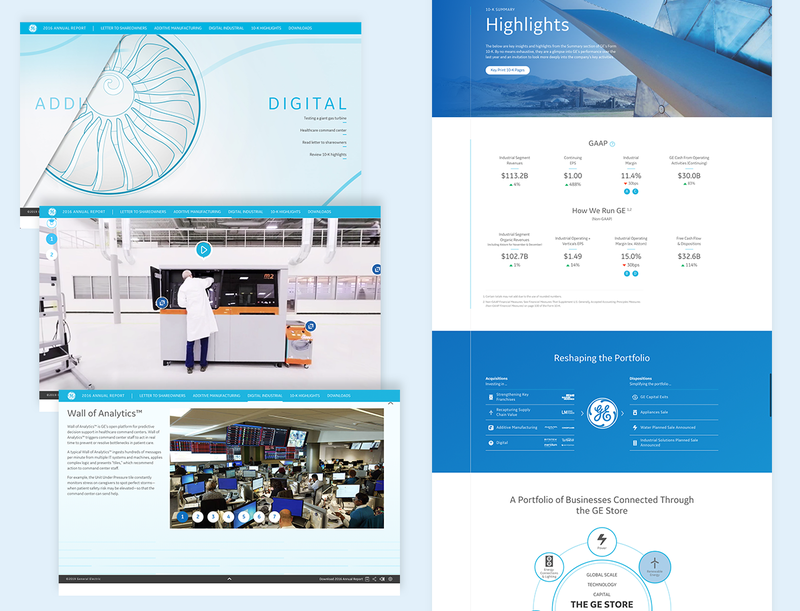 Overall, GE's 2016 Annual Report has a highly professional and clean design. But the best part about this report is the landing area. There are two main sections of the annual report: Additive Manufacturing and Digital Industrial. Both sections start with a 360-degree view of a workplace with ambient sounds in the background. Around the space are clickable prompts to find out more about various services and products. Further on in the report are more standard sections for financial data and text. There are also some interactive charts and videos along the way. 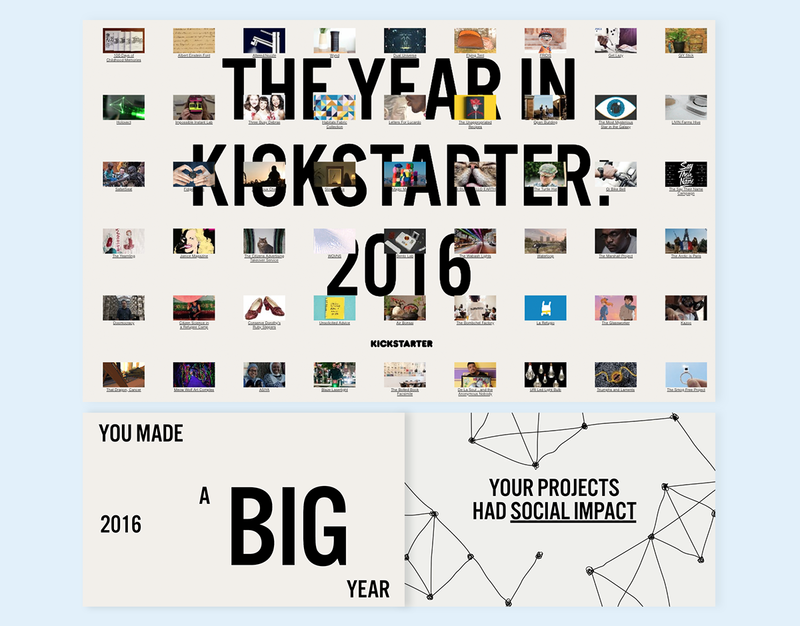 In 2016, Kickstarter published an impressive annual report full of their best projects of the year. The design is set up as a huge colorful slide deck and the large titles invite the viewer to move forward with the story. The showcased projects are clickable and can be viewed on the Kickstarter site. The stats show the results of some of the best Kickstarter projects, from films and books to the preservation of Dorothy’s ruby slippers. This entertaining annual report is a big “thank you” to both creators and backers. In fact, you could say it's a celebration of Kickstarter. Not many annual reports offer to send you a set of temporary tattoos in exchange for an email signup. But that's exactly what Flywheel did in 2015. Their color changing report visualized both important and funny data. They even creatively included a section saying that they received messages with the word “Beyonce” in them twice. They did a great job of storytelling with this annual report, using images of the tattoos as illustrative section separators. They finish the scrolling annual report with a photo of co-founder Tony Noecker getting a real tattoo of the Flywheel logo. Want to create your own interactive annual reports? Crop Trust's 2014 Annual Report is full of important information about the company. Yet, it's so much more than just a standard report. We love how they've designed the report to present a lot of information in a fun way. The first section is devoted to key figures and features unique illustrations with data hovers. Below them, you can navigate through the many different sections of the report. We particularly liked the interactive map about the Global Genebank Partnership. There is a lot to read, but it’s all very well-organized with hover tabs that open intuitively. Things like the interactive map can only be found by navigating deep into the report, so there might be more to discover. In 2014, UZ Brussel used patient stories to create a Year in Review. The storytelling technique is seamlessly set up on a landing page with nine vertical sections that light up as you hover over them. As each patient story opens, there's an animated hero image resembling a cinemagraph. The data of the story is displayed below the image and looks very attractive with illustrations created in the brand colors. Navigation is simple; readers can scroll sideways to the next patient story or click on one of the numbers at the top. This unique way of telling a brand’s Year in Review story through its users is very personalized and sends a great message. 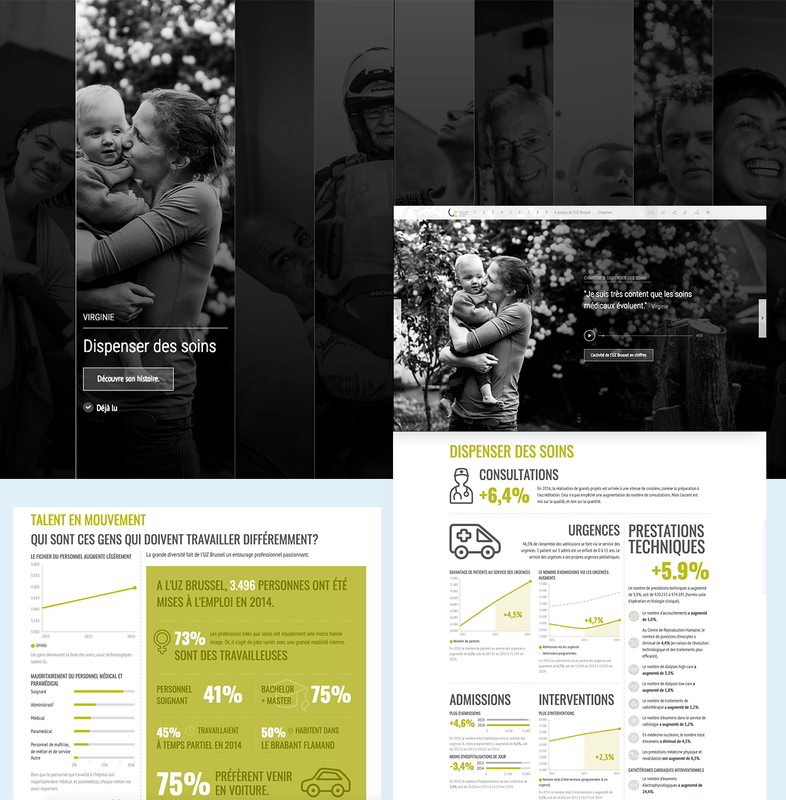 Sometimes, annual reports don’t need to go too heavy on the interactivity to make the information memorable or unique. 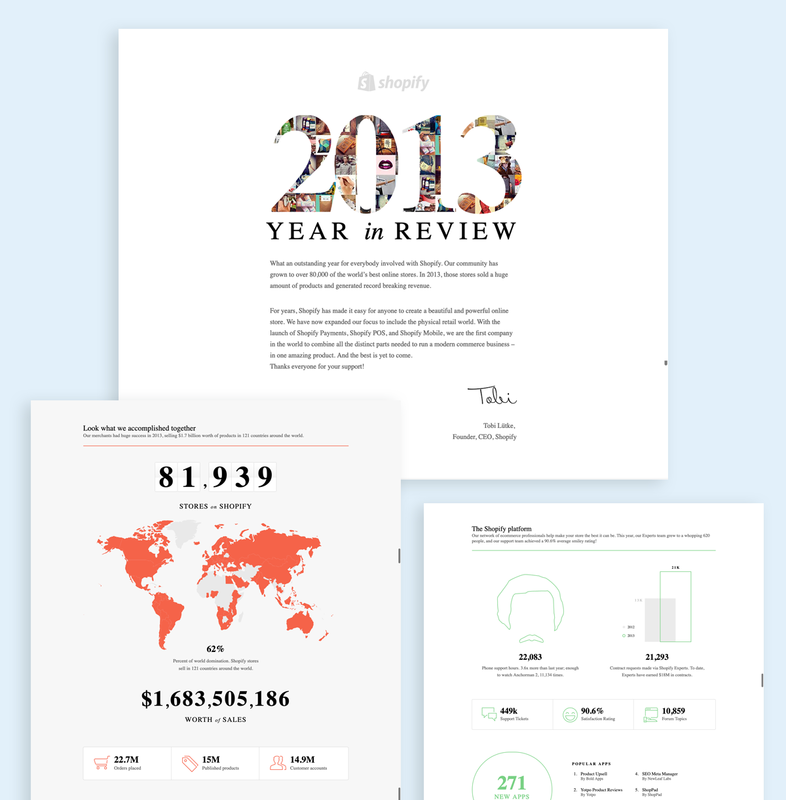 Shopify's Year in Review for 2013 is a great example of that. We appreciate how the financial and growth data is displayed with simple line illustrations that draw themselves as the page scrolls. Following the letter from the founder, there is an animated map that uses colors to show the growth of Shopify stores around the world. The numbers grow from 0 to 82,000 in a very visual way. Overall, this is one of the best examples of how an annual report can use simple animation to send a message with great impact. 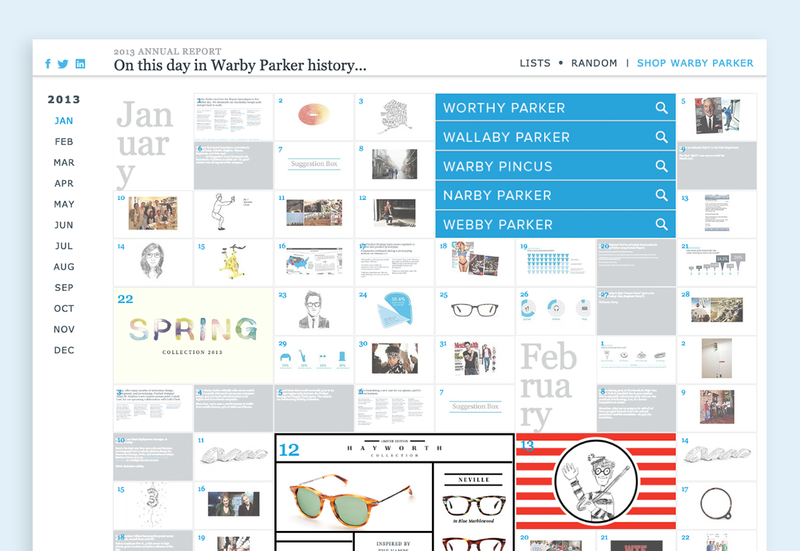 Warby Parker's 2013 Annual Report is designed like a calendar full of important events, fun facts and growth data. The boxes are grouped into monthly sections and can be highlighted according to a specific topic. Each rectangle is clickable and when it zooms in to the center of the screen, it gives information for that specific point in time. The report is also full of hand-drawn illustrations, photographs and animations. Some rectangles are bigger than the others, creating an uneven grid of funny or important days of the year. Like on January 4, they showcase all the misspelled words searched for instead of Warby Parker. Before Twitter moved on to short 38-second annual report videos, they published this online report in 2012. It has main links to different groups of tweets: most loved, most retweeted, trends and new voices. A notable aspect of this Year in Review is that it can be viewed in twelve different languages, which is really great. 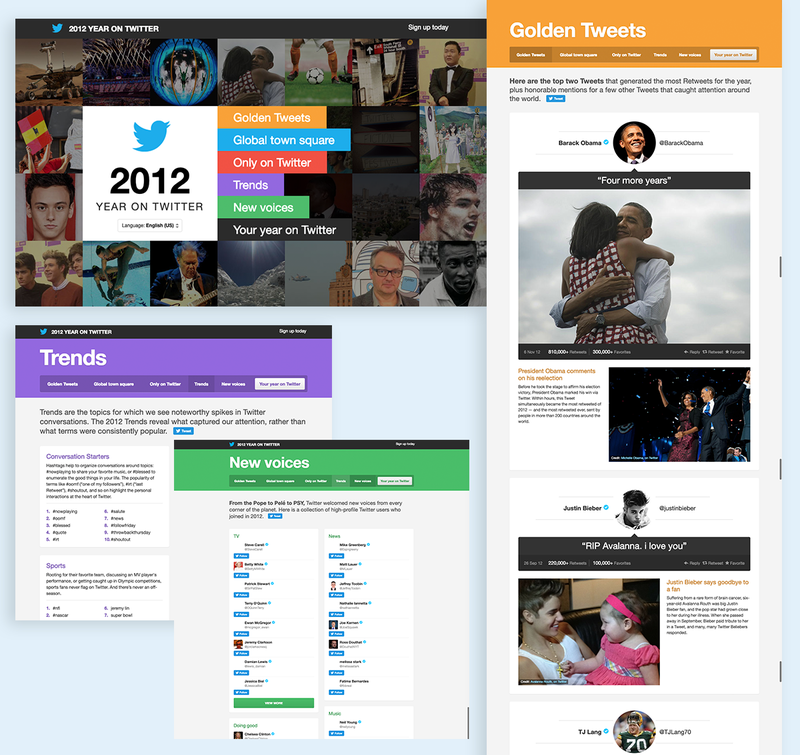 Another unique addition is that viewers can create their own "Twitter Year in Review" by simply logging in to their account with a Vizify integration. Unfortunately, that feature isn't live anymore. The last one on our list of annual reports is this unique printed one from Austria Solar, published in 2011. Although it's nearly a decade old now, this report is still making waves because of its innovative design. The pages of this printed report can only be read in bright sunlight. There honestly couldn’t be a better design for a solar power company. The Austria Solar annual report is one of the most creative and innovative reports of the last decade, and for good reason. Even though most of the creative annual reports these days are digital and interactive, designs like these will always be a breath of fresh air. We would love to see more ideas like this in the future! 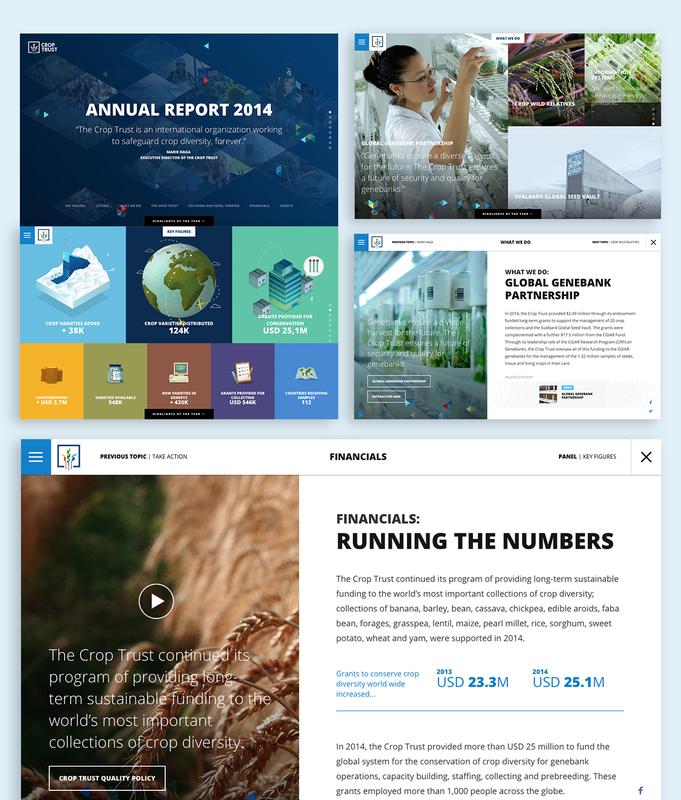 Which of these annual report designs inspired you the most? Feel free to share your favorite visual reports with us in the comments section below.